LOTR Battle Axe of Gimli - Noble Collection(NN2222) The Lord Of The Rings movie swords. 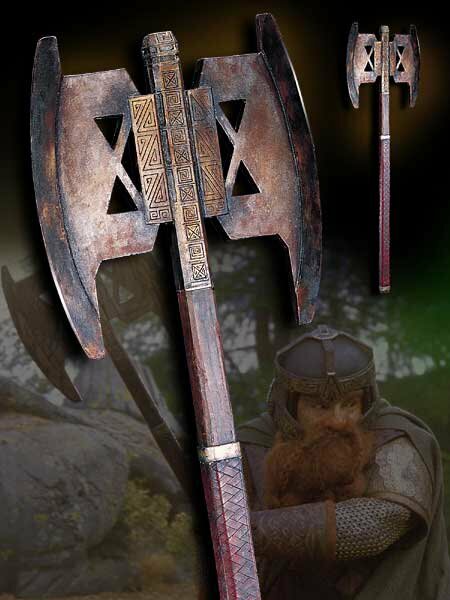 Gimli, the Dwarf, of the Fellowship of the Ring, carries a unique and remarkable double-headed axe that we have recreated in exquisite detail. It is made of wood, leather, and metal and comes with a wall mount for easy display. Measures approximately 86 cm in length.